A:Vaccines can prevent infectious diseases that once killed or harmed many infants, children, and adults. Without vaccines, your child is at risk for getting seriously ill and suffering pain, disability, and even death from diseases like measles and whooping cough. The main risks associated with getting vaccines are side effects, which are almost always mild (redness and swelling at the injection site) and go away within a few days. Serious side effects after vaccination, such as a severe allergic reaction, are very rare and doctors and clinic staff are trained to deal with them. The disease-prevention benefits of getting vaccines are much greater than the possible side effects for almost all children. Published by Oxford University Press for the Infectious Diseases Society of America 2019. This work is written by (a) US Government employee(s) and is in the public domain in the US. A:Vaccines do not overload the immune system. Every day, a healthy baby’s immune system successfully fights off thousands of germs. Antigens are parts of germs that cause the body’s immune system to go to work to build antibodies, which fight off diseases. The antigens in vaccines come from the germs themselves, but the germs are weakened or killed so they cannot cause serious illness. Even if babies receive several vaccinations in one day, vaccines contain only a tiny fraction of the antigens they encounter every day in their environment. Vaccines give your child the antibodies they need to fight off serious vaccine-preventable diseases. Q: Why are so many doses needed for each vaccine? A: Getting every recommended dose of each vaccine provides your child with the best protection possible. Depending on the vaccine, your child will need more than one dose to build high enough immunity to prevent disease or to boost immunity that fades over time. You child may also receive more than one dose to make sure they are protected if they who did not get immunity from a first dose, or to protect them against germs that change over time, like flu. Every dose is important because each protects against infectious diseases that can be especially serious for infants and very young children. A: The recommended schedule protects infants and children by providing immunity early in life, before they come into contact with life-threatening diseases.Children receive immunization early because they are susceptible to diseases at a young age. The consequences of these diseases can be very serious, even life-threatening, for infants and young children. Each state’s Child Welfare Agency has different policies. In most cases, as a foster parent, you need to get consent for emergency and routine medical care for your foster child. You should talk to your child’s caseworker or the agency that placed your child with you about getting consent. Once you have permission, you should ask your child’s caseworker for any available medical records. You can use these records to figure out whether or not your foster child is behind in any immunization. If your child is not up-to-date on their immunizations, you should make an appointment with a doctor. As a foster parent, you should keep records of all vaccinations a foster child receives under your care. Learn about the vaccines that your foster child should receive by reviewing the immunization recommendations: For Everyone: Easy-to-read Schedules. Keep track of your foster child’s vaccines using the Well Child Visit Tracker Cdc-pdf[12 pages] (for children from birth through 6 years old). A: Some vaccine-preventable diseases, like pertussis (whooping cough) and chickenpox, remain common in the United States. On the other hand, other diseases vaccines prevent are no longer common in this country because of vaccines. However, if we stopped vaccinating, the few cases we have in the United States could very quickly become tens or hundreds of thousands of cases. Even though many serious vaccine preventable diseases are uncommon in the United States, some are common in other parts of the world. Even if your family does not travel internationally, you could come into contact with international travelers anywhere in your community. Children who don’t receive all vaccinations and are exposed to a disease can become seriously sick and spread it through a community. A: Combination vaccines protect your child against more than one disease with a single shot. They reduce the number of shots and office visits your child would need, which not only saves you time and money, but also is easier on your child. Some common combination vaccines are Pediarix® which combines DTap, Hep B, and IPV (polio) and ProQuad® which combines MMR and varicella (chickenpox). 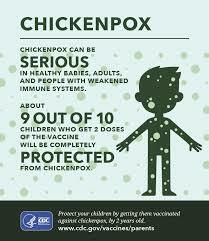 A: Your child needs a chickenpox vaccine because chickenpox can actually be a serious disease. In many cases, children experience a mild case of chickenpox, but other children may have blisters that become infected. Others may develop pneumonia. There is no way to tell in advance how severe your child’s symptoms will be. Before vaccine was available, about 50 children died every year from chickenpox, and about 1 in 500 children who got chickenpox was hospitalized. A: Talk with your child’s doctor, but children can usually get vaccinated even if they have a mild illness like a cold, earache, mild fever, or diarrhea. If the doctor says it is okay, your child can still get vaccinated..
A: Yes, even breastfed babies need to be protected with vaccines at the recommended ages. The immune system is not fully developed at birth, which puts newborns at greater risk for infections. Breast milk provides important protection from some infections as your baby’s immune system is developing. For example, babies who are breastfed have a lower risk of ear infections, respiratory tract infections, and diarrhea. However, breast milk does not protect children against all diseases. Even in breastfed infants, vaccines are the most effective way to prevent many diseases. Your baby needs the long-term protection that can only come from making sure he receives all his vaccines according to the CDC’s recommended schedule. The Texas Vaccines for Children (TVFC) program provides low-cost vaccines to eligible children from birth through 18 years of age. Follow link to find out if your child is eligible. Why is it important to monitor vaccine safety?Vaccines are held to the highest standard of safety. The United States currently has the safest, most effective vaccine supply in history. Years of testing are required before a vaccine can be licensed. Once in use, vaccines are continually monitored for safety and efficacy. Educate yourself, family members and children about vaccines. Remember to gain your knowledge with credible sources. Find facts, scientific research, and statistics from trusted published sources. Vaccinate your children against deadly diseases, protect them safely. visit  https://www.cdc.gov/ to learn more. The Content is not intended to be a substitute for professional medical advice, diagnosis, or treatment. Always seek the advice of your physician or other qualified health provider with any questions you may have regarding a medical condition. Source: Taylor B, Miller E, Farrington CP, et al. Autism and measles, mumps, and rubella vaccine: no epidemiological evidence for a causal association. Lancet 1999;353:2026-2029. Oxford University Press for the Infectious Diseases Society of America 2019. This work is written by (a) US Government employee(s) and is in the public domain in the US. Law Enforcement- First Aid Focus- Is your equipment even preparing you for providing first aid?